For quick and even cooking cut vegetables in equal size. A larger quantity of food requires a longer cooking time. Food with a higher moisture content cooks faster, eg. Lauki will cook faster than carrot. Foods rich in sugar and fats cook and reheat faster. Dishes containing curd, cream are best cooked on reduced power levels. 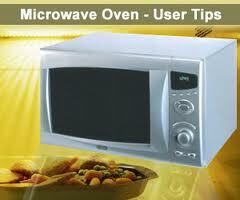 To test if a dish is microwave - safe, put it in to microwave oven along with a glass of water at 100% power for 1 minute. The dish should remain cool. Use only microwave - safe cling film to cover dishes. Good alternatives: grease proof paper or a micro safe plate. Paper napkins are a good idea when you don't need a cover, as such , but need to avoid spattering. Use the low or high rack to heat or cook two batches of food simultaneously. When heating drinks use 100% for water based drinks, 70% for milk or sugary ones, to avoid spillovers. To reheat burger, bread or chappatis, cover in a cloth napkin or paper towel to prevent sogginess. You can use wet napkin also, but make sure to remove water from it. Indian milk-based deserts cook beautifully in microwave at reduced power levels. In general, when converting your own recipe for microwave cooking, reduce water quantity since minimal evaporation takes place. For drying mint (fudina) or methi - wash the leaves very well and leave to drain and dry naturally as much as possible. The dryer they are, the shorter will be the time needed in the oven. 100 grams of greens need about 10 minutes at 100% power. It is best to do them in small batches. Blanching Almond - Put the almonds in a bowl, pour over water to cover, heat till the water is hot, stand 2 minutes and then just slip the skins off. Peeling Garlic - This is useful if you have a large quantity of garlic to peel. Follow the same procedure as for almonds expect that you do not need to heat the water to a comfortable warmth. Stand for a few minutes,then peel. Pulping Tamarind - With the microwave, you don't have to pour water over tamarind and wait for it to soften before sieving it. Pour the required quantity of tamarind in a bowl, pour over water just to cover and heat till the water is very hot. Stand 5 minutes, then sieve and use. Blanching Tomatoes - Some recipes call for skinned tomatoes. Prick each tomato at a few spots and put the required number on a plate.Catering for about 40 seconds per tomato, microwave at 100% power. Stand for a few minutes and just slip the skins off. Since the tomatoes get heated through, they are also easier to mash smooth. Making Ghee - An otherwise laborious process that it dramatically simplified in the microwave. This is what you need to do: Put the butter in the microwave safe - dish. In the first stage, cook uncovered till the butter just melts, than cover at 100% power till the fat solids turn a light brown and start floating on the surface. Strain, discard the residue and store the Ghee in a clean jar. - 250 grams of butter would need about 2 1/2 minutes to melt, then about 13 to 15 minutes to turn into Ghee. You would need to stir occasionally. Exact timing would depend upon the moisture content in the butter. Normally you would be using fresh home - made butter, made from malai to do this. Cottage Cheese ( Paneer ) - You may feel this process is equally simply done on fire but consider this; there is no danger of milk sticking at the bottom, the quality of the cottage cheese is smooth and velvety and, at the end, you have only a glass dish to wash up. To make cottage cheese take 4 cups of milk to boil. It will take 6 minutes at 100% power.Stir in juice of 1 -2 lemon or a few spoons of whipped curds. Stir. The milk will curdle and the greenish whey will separate. Cook another minute. Stand 2 - 3 minutes before straining. Making Papads - Though this may not be a dreaded task for the experienced cook, the microwave can certainly alleviate the novice's fear. Lay a paper napkin on the oven turn table. Put 3 papads on it. Microwave at 100% power for 40 seconds. Turn the papads around so the inner bits go on the outer circumference. Time another 30 seconds at the same power level. Stand 2 minutes before serving. You can expect evenly cooked papad with no overly burnt bite every time. You will notice that they have special crispiness which you cannot achieve when you roast on the fire. You may need 10 - 20 seconds extra cooking time depending on the quality and thickness of the papad. Setting perfect Curds - The microwave can help you get perfect results every time since you can work out the exact timing to your preference. The milk for the curds can be heated in a bowl in which it is going to be set, a boon in winter. As a rough guide for nervous beginners, in summer heat 2 cups milk for approximately 2 minutes. It should feel comfortably warm. ( Stir the milk before checking.) In winter you will need approximately double the amount of time as the milk should be comfortably hot. A couple of day trial will help you work out exact timing of your own preference. Making Coconut milk - Put 1 cup grated coconut and 1 cup water in microwave safe bowl. Microwave covered at 100% power for 3 minutes. Leave to infuse before straining. Roasting Nuts - Roasted nuts, to be used as garnishes over rice or other cooked dishes, are a delight in the microwave since you can eliminate some calories by roasting instead of frying. They are delicious eaten as they too dressed with some spices. Peanuts can be served hot with some lightly sauteed onions and green chills. To roast the nuts, spread out on a microwave - safe plate. Microwave at 100% power till the nuts are aromatic, slightly puffed and beginning to brown. 1/2 cup almonds, cashews, pistachio (unpeeled ) or walnuts would need 2 minutes 20 seconds; 1 cup 3 minutes 30 minutes. Stand before tasting - they crispen as they cool.